Last week was one of those weeks. It ended (rather appropriately) with me smashing a bottle of Bovril on the tiles of my kitchen floor in an attempt to make myself some toast. (Shout out to Bovril! I am so very fond of you, but for goodness sake… It’s time to make the move to plastic). I took this mild tragedy as a universal sign from the fitness gods that they really don’t want me to eat carbs. Unlucky. (On a side note: breaking a mirror means seven years of bad luck, but what on earth does it mean when you break your Bovril?) If I had to sum up last week as a whole by creating a TV show name for it, it’d be… Yup, you guessed it, Breaking Bovril. Ha. So with my kitchen being one bottle of Bovril down and smelling undeniably beefy (in the very worst kind of way), I sought to bake the broken Bovril blues away. (I do realise that this is an obscene amount of alliteration for a Wednesday…Sorry, I’m not sorry). It had been a challenging week for me and the trials and tribulations had got me thinking… It’s been said that opportunity dances with those already on the dance floor, and I by no means disagree. However, I do feel that every now and then, we need to let go of the same old choreography and be brave enough to bust a bit of freestyle in order to change it up a little and try to approach things a little differently? (Bear with me here). Especially these days when the metaphorical dance floor is seemingly always crowded and we need to set ourselves apart from the rest. But in the same breath, it must also be said that sometimes we need to learn to sit out a few “dances” to avoid looking like a member of the cast from Step-Up 3 (Remember them? Me either. Case and point). You’ll get your chance to be Channing Tatum one day, but until then, don’t be that badger who never knows when to do less. Patience is a virtue, it’s not always one of mine, but it’s a virtue nonetheless. This sentiment brought on the epiphany that the right opportunities in life are remarkably much like the results of baking… More often than not, they’re worth waiting for and well worth the preparation and steps involved. 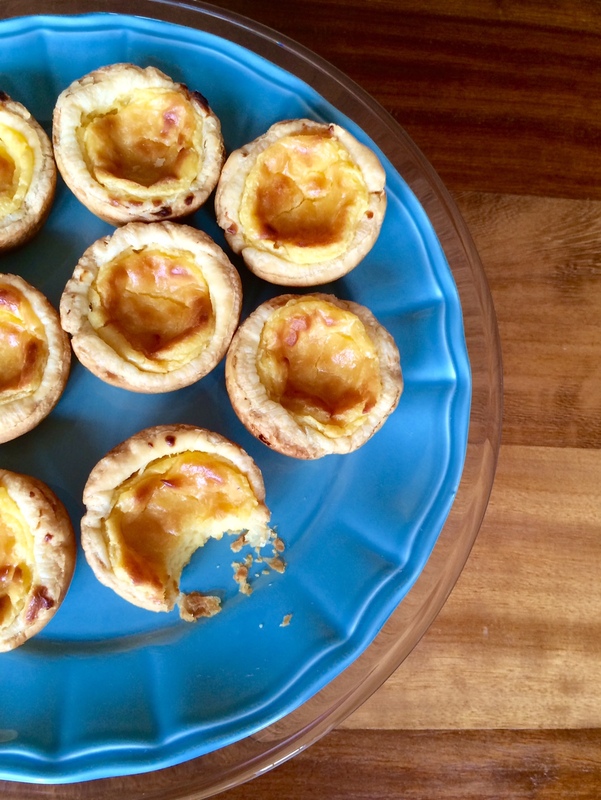 These devilishly delectable Dis-Custard Tarts are definitely worth having a little patience for. Got a little Portuguese in you? No? Well, would you like some? Ha. (Not in that way you sicko.) 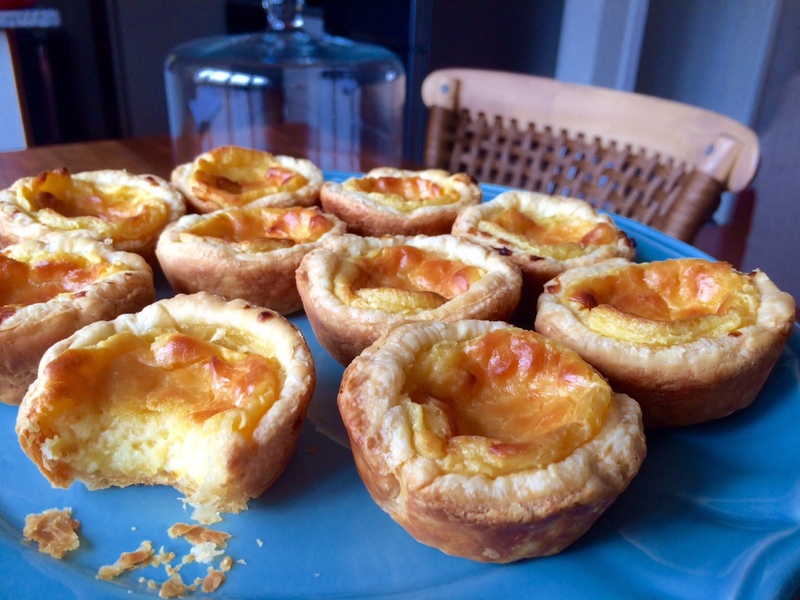 These are my take on the Porra classic Bolo De Nata and they are phenomenal (even if I do say so myself…) I may even go a step further to say that these are the Channing Tatum of baked custard pastries? Yoh. (That’s South African slang for “wow”, “jeepers” or an exclamation of disbelief… You’re welcome). These tarts involve the art of making “Rough Puff.” (Another side note: I know that this may sound like the newest addition to the Hillbrow drug scene, but I can assure you, it’s only puff pastry). Before you get all Avril on me, “Why’d you have to go and make things so complicated?” Should you lack the virtue of patience, for goodness sake, go out and buy a roll of ready-made. I won’t even judge you… (Well, not that hard anyway). I’ve always been a lover of custard and no offence to Ultra-Mel (I brazenly hit that straight from the carton), but homemade custard is, and always will be, king. Normal folk are somewhat frightened by the idea of making their own custard but let’s be honest, there are far scarier things in life to contend with. For instance, getting old, bad haircuts (look, we’ve all been there) and of course the Tax Man (Hi SARS). Some argue that there are no guarantees in life, but I straight up disagree and can assure you that this custard filling recipe is a guaranteed winner… time after time. (And yes, I realise that I may have just unintentionally quoted Cyndy Lauper). These Dis-Custard Tarts aren’t the prettiest thing I’ve ever baked, I’m not ashamed to admit that. But the sheer deliciousness of the custard filling is a beauty unto itself, as is the way it plays so nicely with the buttery decadence of flaky puff pastry. If you taste these and don’t get emotional like a contestant on any given episode of American Idol, you simply don’t have a soul (or working taste buds). So this one’s for Ric, the most illegitimate Porra I know, for Jet (who told me I had to master these or we couldn’t be friends anymore), for Suth who isn’t afraid to tell me when he thinks I’m being an absolute “Badger” (that’s an “idiot” for those who don’t speak Suth), and for my mom who used to bring these home every time she went grocery shopping because my dad and I absolutely loved them. Yours in Baking, Bitching and warm custardy goodness (Because “xoxo” was too mainstream and because if “custardy” wasn’t a real word… it is now). In a large mixing bowl, sieve the flour and break the butter into small chunks. Rub the butter into the flour mixture loosely with your fingertips. Don’t over rub, you still need to see bits of butter. Make a well in the middle of the bowl and pour in the cold water. Mix well, adding more water if you need to and form a dough. Cover with cling wrap and refrigerate for 20 minutes. Preheat the oven to 200 degrees centigrade and grease a twelve pan muffin tin. Place egg yolks, corn flour and sugar into a saucepan and whisk together until there are no lumps. Milk in the milk and cream until well combined and then place saucepan on medium heat until mixture thickens and starts to boil. Let simmer for 3 minutes whilst stirring, you will see the custard thicken. Remove saucepan from heat and add vanilla extract. Transfer to a glass bowl, and cover with cling wrap that touches the surface of the custard to prevent a skin from forming. Leave to cool. Remove pastry from fridge, Roll on a floured surface to form a 20cm X 40xm rectangle. Fold it over and repeat three times. You will notice a marbled butter effect. Cut out circles of pastry with a cutter or a mug. (I used a mug). Press pastry circles into muffin tin and fill ¾ full with custard. Bake for 25 minutes or until custard has browned on top. Health Hack: Replace the sugar with xylitol for less guilt in your custard… (But trust me, it’s SO worth it! Don’t be a badger, use sugar). Previous Post Do you know the Muffin Man?